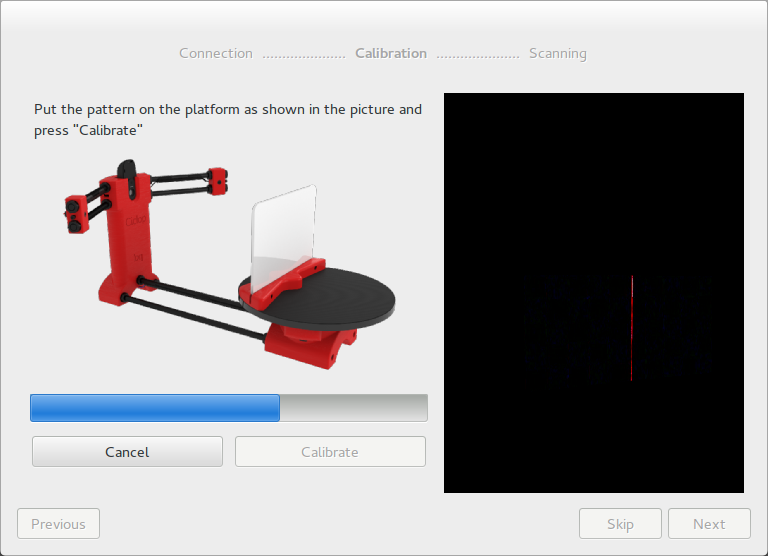 Create new: it allows to launch the Wizard or any workbench. Open recent file: it provides direct access to the latest models (ply or stl). Pressing over Wizard mode, an interactive menu appears for configuring the scanner step by step. This window contains the scanner connection, a preferences panel and the auto check process. Connect/Disconnect: connects the camera and the electronics of Ciclop. If a device can not be found, a notification message is thrown. 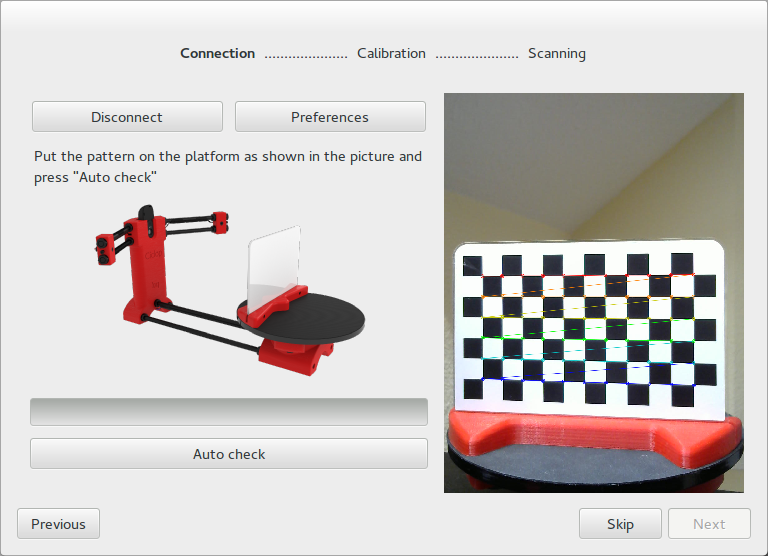 Preferences: allows to modify the Camera ID and the Serial name of the scanner. Also the Luminosity. This setting can take High, Medium or Low for high, medium of low ambient light. 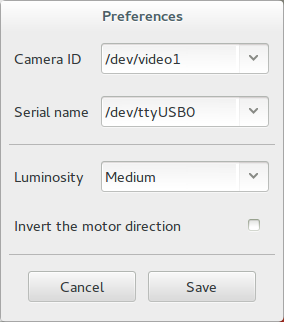 The setting Invert the motor direction inverts all the motor angle commands. Pattern detection: indicates whether the pattern is not detected correctly by luminosity or brightness problems. Motor direction: detects if the motor direction is reversed and how to correct it. Lasers detection: detects if the lasers have been connected properly and are working. The first time Auto check is pressed, a menu appears indicating if the lasers want to be aligned. This is for manually moving the orientation of the lasers until the emitted line is perpendicular to the platform. It requires an Allen wrench. In this windows both the lasers calibration and the platform calibration are performed. 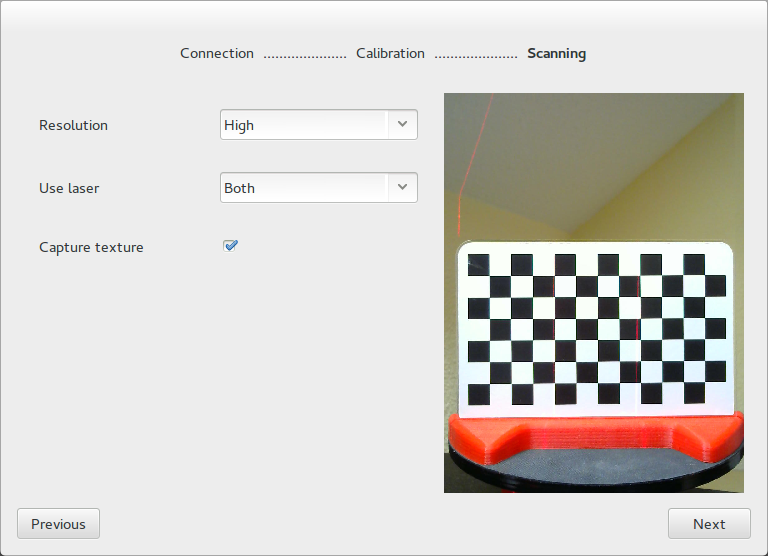 This calibration process computes the planes in the space respect to the camera for each laser, as well as the spatial relation between the turntable and the optical center of the camera. The first time the calibration is performed, Origin pattern distance must be set. 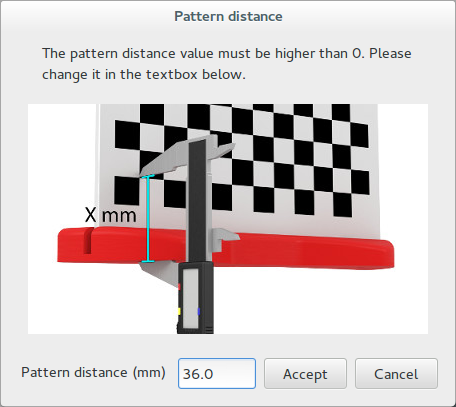 This distance is fundamental for the platform’s calibration, because it indicates the real relation between the position of the pattern’s sticker and the base. Resolution: it is related to the number of steps per revolution of the motor. Laser: selects left laser, right laser or both. Capture texture: enabling this option captures the real color of the object. Otherwise the point cloud has an uniform fake color. Once the Wizard is completed, access the main window.